After a closed-to-the-public session during its council meeting Monday night, North Huron Township Council announced it would be attempting to negotiate the purchasing of land for the construction of the joint fire hall and public works facility in Blyth. No specific property was named. Prior to the decision, North Huron staff provided more information as to what exactly a new Blyth fire hall and Blyth public works shed would cost. After reviewing all expenses, depending on location, a combined fire hall and public works shed is estimated to cost between $2.3 and $2.9 million. 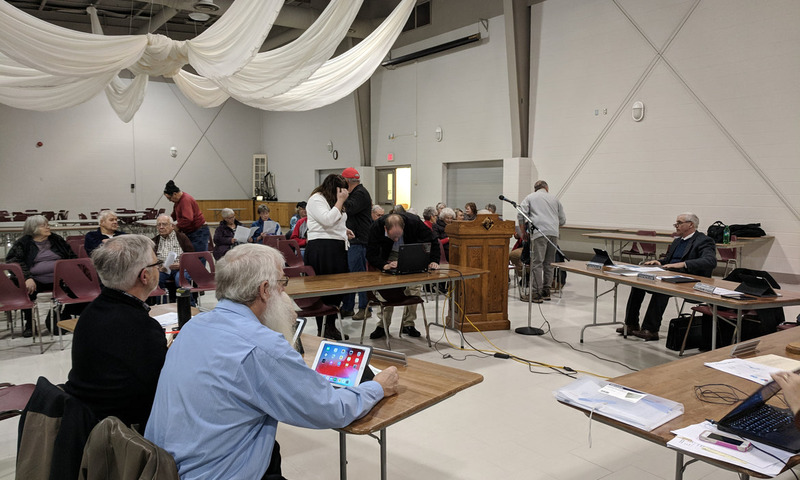 Prior to going into closed session to discuss private property options, Reeve Bernie Bailey addressed those in attendance, saying that he wanted to respond to some comments made during the special meeting held in Blyth on Jan. 30. He explained that council asked the fire department to indicate the safest location for the fire hall owned by North Huron. “They did that,” Bailey said. “The ballpark was the safest place to get the fire people in and get the fire people out. “I want it very clear the chiefs and deputies did what council asked of them,” he said. Following Bailey’s comments, Director of Public Works and Facilities Sean McGhee spoke to council and to the assembled ratepayers, filling in some of the holes of information that frustrated ratepayers during the Jan. 30 meeting. McGhee outlined the priorities of the project, reviewed the steps taken thus far and then explained exactly how much the fire hall and public works project would cost. To build the hall at the Gypsy Lane location, also known as the Radford Memorial Baseball Diamond, would cost an estimated total of $2.3 million. The North Street project, which would see the new hall and shed located beside the water treatment plant would cost $2.5 million. Finally, McGhee explained that, if council were to purchase private land, it would cost an estimate $2.5 to $2.9 million for the project depending on the property. McGhee also explained that the $2.5 million budget suggested at the Jan. 30 meeting was not entirely accurate. After tallying the outstanding amount left on the loan, penalties accrued and an early payment penalty, the municipality had $2.2 million left from the $3.5 million paid for the Emergency Services Training Centre. The final result is that, if the project went ahead, building on Gypsy Lane would cost $153,438 more than the $2.2 million budget, meaning this year’s budget would need a three per cent increase. For a private property, the project would cost $318,538 to $667,238 more than the $2.2 million budget, resulting in a six to 12 per cent increase in the budget. Bailey explained that council would go into a closed session at the end of the meeting to discuss the issue, with Deputy-Reeve Trevor Seip adding that the session was specifically to deal with private property options. Before going in camera, Seip said that council had heard the strong resistance to the Gypsy Lane location during the Jan. 30 meeting. Bailey also commented on the issue before the closed session, saying that council was following the strategic plan laid out by the previous council which prioritized economic development, communication with ratepayers, operational costs and health and safety, in that order. After leaving the closed-to-the-public session, council voted unanimously to pursue negotiations for land for the fire hall, with Seip explaining that while the Gypsy Lane site was off the table for the immediate future, it was being held as a “last resort” option. He said if all negotiations fail, however, it could come back to that issue. He said he wanted to make it clear that the diamond could still be considered if that occurred.